Marlene was a 15-year-old, Long Island high school student when she smoked her first cigarette. Soon she was teaching her girlfriends how to inhale and within months she was hooked on nicotine. It was the 1960s and Marlene thought smoking made her look cool. Cigarettes became Marlene’s constant friend, a friend who was with her through good times and bad. As an adult, Marlene (last name withheld) married Jonathan, also a smoker, and together the couple raised three daughters. Decades later, Marlene, now in her late 40s and still smoking, began to notice problems with her vision. Initially, the changes were subtle, with only some small, cloudy spots in her vision. Soon, however, Marlene started noting other changes. Watching television, for example, was no longer enjoyable because the picture looked distorted. Reading was also difficult and driving a car had become challenging. Jonathan became more concerned when vision issues caused Marlene to frequently lose her balance and sometimes fall. Then, she cut herself while chopping vegetables. Her vision was now so impaired she mistook her thumb for a carrot. About this time, the couple had a bathroom in their home professionally tiled, Jonathan was pleased with the outcome, but Marlene was not. To her, the tile didn’t look straight, appearing instead like a big mass of wavy lines. Jonathan insisted it was time for Marlene to see a doctor. Their quest for answers was a long journey. Marlene saw numerous eye specialists; however none of them was able to explain her baffling condition. Finally, at age 56, Marlene was referred to a retina specialist who diagnosed a serious eye disease called age-related macular degeneration (AMD). A progressive disease, AMD has no cure and until recent years no effective treatments. In Marlene’s case, she had a more aggressive type of AMD. AMD does not cause complete blindness, but it does destroy the eye’s central, straight-ahead vision that is needed for reading, driving, recognizing faces and completing countless everyday tasks. The disease leaves the peripheral or corner vision untouched while the vision center eventually becomes a black hole. Like many people, Marlene and Jonathan had no idea smoking, and even second-hand smoke could lead to AMD or that some 15 million American are living with various stages of the eye disease. Marlene’s physician advised her to stop smoking immediately. However, from experience she knew quitting cold turkey wasn’t that simple. Although Marlene had tried to stop numerous times over the years, tobacco had a very strong hold on her. In the end, she always returned to smoking. Since Marlene had never successfully quit, she didn’t have confidence in herself to try again. But several years later, Marlene and Jonathan learned some news that would change their lives. One of their daughters was pregnant, and they would soon be grandparents. This happy news was the incentive they needed to stop smoking. It wasn’t easy, but with help from her primary doctor who prescribed medications and patches, Marlene quit tobacco for good. Jonathan followed suit and gave up cigarettes as well. The couple now has five grandchildren, and Marlene can see all of their faces. Her vision has improved, thanks to a drug treatment developed for AMD. 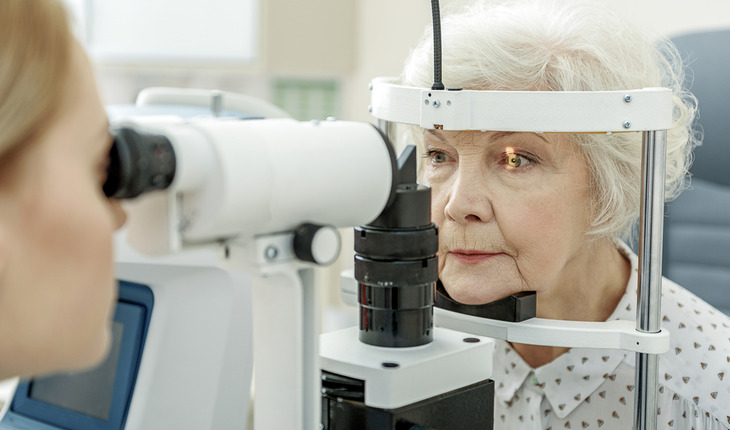 Every month, Marlene visits her retina specialist. With her eyes clamped open, her doctor uses a large needle to inject medication into each of her eyes. Although she is afraid of needles and finds the injections very uncomfortable, Marlene is more afraid of losing her ability to see. Once considered legally blind, Marlene, now age 69, reports her eyesight has improved to the point where she can once again drive. She has undergone over 300 injections and anticipates having them for the rest of her life. However, the injections are not a cure. Marlene still has AMD and the disease is still progressive and incurable. Marlene wants to tell others about how tobacco robbed her of good vision. For this purpose, she has teamed with the Center for Disease Control (CDC) on a national health campaign, called Tips from Former Smokers, to promote tobacco education. Recently, she spoke at a local grade school where the kids gave her a standing ovation. She told them what she always tells people: Don’t start smoking and if you do smoke, stop. The CDC website highlights the consequences of smoking and exposure to second-hand smoke. The site offers information and options about how to quit. Also featured are real-life profiles of people, like Marlene, who were former smokers. Read more about Marlene’s story and view videos of her eye treatments at this link. For information about stopping smoking, call 1-800-QUIT-NOW or visit this link for information and tips on quitting.